The research conducted by the Clark Group focuses on Atomic Force Microscopy (AFM) instrumentation development. Specifically, we focus on developing appropriate control methodologies and signal processing techniques for advanced AFM research. By studying the AFMfrom a dynamic systems, measurements, and controls approach, we are able to customize the instrument and controller architecture for specific applications thereby increasing the capabilities and sensitivity of the instrument. 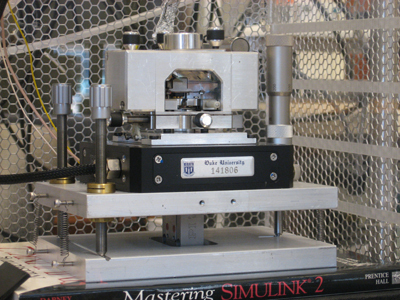 As part of this research, the Clark group has constructed two custom multi-axis AFMs and numerous software packages to operate the equipment. In atomic force microscopy based single molecule force spectroscopy (AFM-SMFS), it is assumed that the pulling angle is negligible and that the force applied to the molecule is equivalent to the force measured by the instrument. Recent studies, however, have indicated that the pulling geometry errors can drastically alter the measured force-extension relationship of molecules. To minimize potential pulling geometry errors, we have developed a software-based alignment technique that repositions that cantilever such that the applied force is aligned with the measurement axis of the AFM. 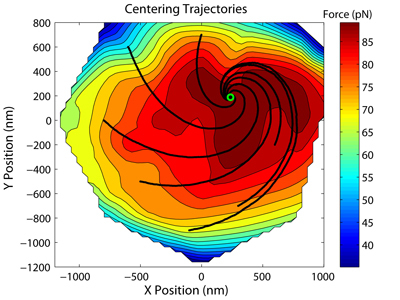 Trajectories taken by the cantilever during alignment simulation (black lines) on the contour plot of the measured BS-transition forces of I-phage DNA. 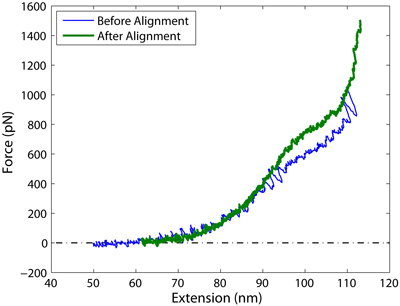 Force-extension profile of a dextran molecule obtained before (blue) and after (green) alignment. Researcher: Robert L. Clark, Ph.D.